Wonderful anime series Attack On Titan (based on the delightful manga book series of the same name) is coming back! Let's all celebrate by gorging ourselves on the local villagers! 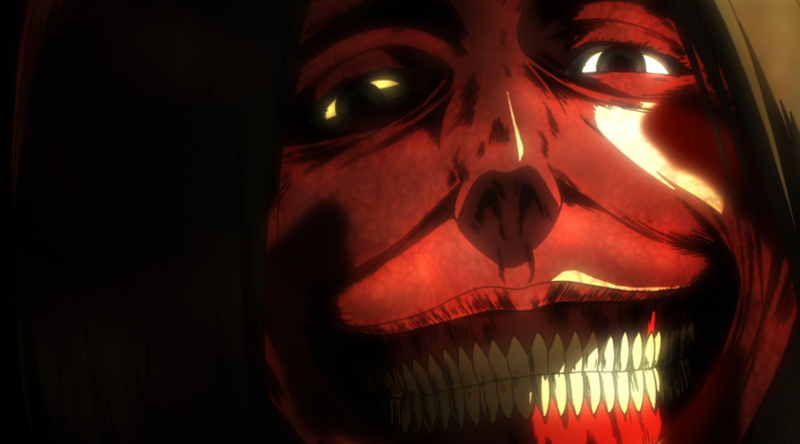 Attack on Titan is set in a world plagued by giant titans that stomp about gobbling up humans at random. It's unnaturally messy and bloody and horrific and really just wonderful. So naturally we've all been waiting for the next installment of the anime series. And news has it the second season of the series has been confirmed, and production started last month! But still no official premiere date. Until then get excited about the two new episodes (non-related to the second season) that will premiere sometime before the new season based on the prequel novel Attack On Titan: No Regrets. According to Bleeding Cool, the prequel episodes will be released on December 9th and April 9th. And on top of all that, the English-dubbed first series will be combined into two films and screened separately. The first film will premiere on November 22nd.